Summer has ended, but there is fun to come in Autumn. 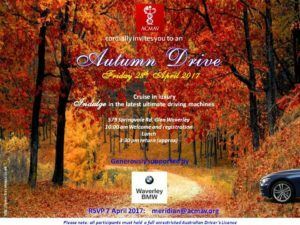 ACMAV Members are invited to an exclusive BMW Scenic Autumn Drive on APRIL 28 2017. Get your hands on the latest vehicles, and experience one of Melbourne's best scenic drives. Send in your RSVP in now!